I love prayer, I love to dive into prayer, immerse myself under the water and allow my body to sink just a little before resurfacing. But deep prayer needs time to develop, to root and to grow, even neglected it pulls on that deep history of relationship and tension of understanding. One of the biggest regrets I have is that I do not have a regular church family for Adam. I have breathed prayers over his sleeping form in the crib, I held my conversations with my creator in the moments when his attention was elsewhere, I ached for him to know the love of a God who, in hindsight, I barely introduced him to. 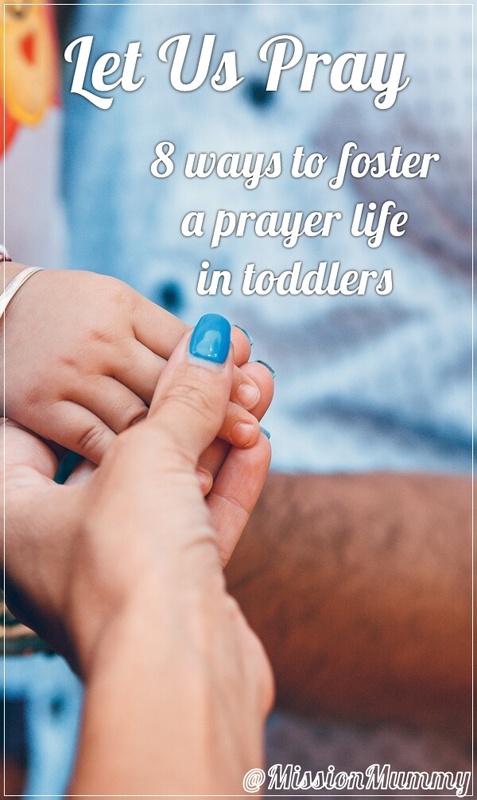 So how do you introduce and foster a prayer life in a toddler or preschooler without going hyper spiritual overnight? Asking a child to talk to an invisible power who will watch over them can seem a little intimidating. Mostly you dig the soil, till the ground and wait for God to plant the seed. Here are my 8 starting points. 1. Inform them. Say what you are going to do, expand if they ask questions. If preschoolers sense something is important to you they will take it more seriously over time. 2. Read books. I’ve been deliberate about reading the christian books we had, it took off most at Christmas but the kids bible is one of the regular options for him at bedtime and it being a real story means he was drawn to the different style. 4. Say grace. I grew up saying the simplest grace I know. That grace is now said every time our family sits at the table. It’s easy to learn, it’s easy to memorise, and it’s easy to say real fast. 5. Begin bedtime prayers. Adam sits next to me or on my lap for our story-time and I keep him there a few seconds longer, holding his hands together for our brief prayers. We thank the Lord for the good things about our day and ask for a good night sleep. Slowly we are thanking God for his good gifts to us and introducing our own needs. We are moving towards recognising God and bringing our praises to him. 6. Do one thing consistently, solo if necessary, to form a routine. Pray the prayer out loud even if they don’t. I prayed with Adam for weeks until one day I forgot to add a thanks for playing with a certain friend, he couldn’t resist adding it between “in Jesus name” and “Amen”. 7. 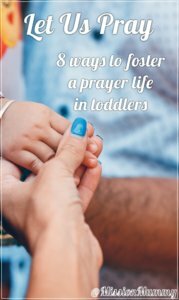 Start with Jesus, his character is much more relate-able to young children. Adam calls bibles Jesus books and I’m not correcting him. The first bible stories have sad endings, Adam and Eve are thrown out, the world is flooded, people are pushed away from friends at babel, Joseph is sold and jailed and Moses is thrown into a river. 8. Work backwards. Decide what kind of spiritual life you’d like to be sharing with your child and then plan steps to that goal. Do you want to aim for family devotionals? Scripture memorisation? Exclude time spent in church from this equation – because it’s a different environment. Mummy: Do you want to say the prayers tonight? Adam: Thank you for a today playing outside with my friends. Thank you for the rain that makes plants grow like strawberries. Thank you for the rain that makes plants grow big and tall so we can have a picnic. In Jesus name, Amen.